Notice a pattern? Yup, it’s dominated by Asian restaurants. Along with specialized grocery stores, Rockville is becoming the place for Asian food in greater DC. 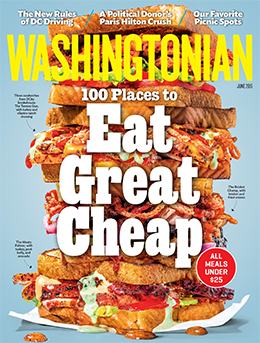 The best Thai and Vietnamese restaurants seem to be in Wheaton and Falls Church, so perhaps ours will make the cut next year. DCist recently listed the best places to get dumplings in the DC region, with seven of the nine restaurants listed in Rockville. Although restaurants in Rockville are barely considered by the Washington Post and Washingtonian magazine, the food scene is growing deeper and bigger, which is evidenced in part by this dumpling study. Many Chinese restaurants include dumplings on their menus, but these restaurants focus their menus around them or serve an extraordinary version of them. If you haven’t tried Chinese dumplings, there are many types of choose from but usually are ground pork or shrimp wrapped in dough and then steamed. The portions are usually big (think 6-12 dumplings per order) and I always bring my own bottle of sweet chili sauce to add some zing (these are simple homey restaurants, so they’re not offended if you bring your own condiments). A&J Restaurant, 1319-C Rockville Pike (in the funky colorful industrial strip mall just south of Woodmont Country Club). Specializes in dim sum from northern China, and while this restaurant is incredibly popular (the parking lot always seems packed), I’ve always preferred the dim sum from the south (give me a Hong Kong dim sum palace any time!). Carbon, 100-F Gibbs Street (Rockville Town Square). Haven’t eaten here yet, but it serves Peruvian-style charcoal-grilled chicken and is owned by the same family as La Canela just down the street. China Bistro, 755 Hungerford Drive (just north of the Giant). Haven’t eaten here because I’m still working my way through all the Chinese restaurants on my end of town, but I hear this is supposed to be the best place in MoCo for dumplings (and who doesn’t like Chinese dumplings!). La Limena, 765-B Rockville Pike (just north of Wooton Parkway, near the IHOP). I can’t believe there’s a Cuban place in town I haven’t tried, but here it is. Pho 75, 771 Hungerford Drive (just north of the Giant). One of the five Pho 75 restaurants in the DMV specializing in the satisfying Vietnamese soup. Sichuan Pavilion, 410 Hungerford Drive (just north of the fire station). And again, another Chinese restaurant to visit once I finish south of Beall Avenue. Spice Crossing, 100-B Gibbs Street (Rockville Town Center). One of my favorites. Viet Goel Tofu (aka Lighthouse Tofu), 12710 Twinbrook Parkway (between the Rockville Pike and Viers Mill Road). I recently overcame the odd name and ventured inside this Korean restaurant to enjoy an endless assortment of appetizers followed by a delicious silken tofu soup served in a sizzling stone bowl. Nothing like a meal with a show!